Samsung’s Galaxy S9 and Galaxy S9+ are class leaders in so many different ways. They’re crazy powerful and they offer top-notch performance. They also have the best displays in the industry and the best cameras of any phone available right now in the US. But there’s one are where they’re definitely lacking: battery life. If you love your Galaxy S9 but you want to give the battery a bit of a boost, we’ve got just the thing. 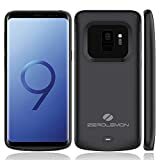 Amazon’s prices on the ZeroLemon Galaxy S9 Battery Case and the ZeroLemon Galaxy S9+ Battery Case both dropped to just $39.99, and the Galaxy S9 model has an on-site coupon that knocks off an extra 20%! These cases will more than double the battery life of either Samsung phone, so definitely pick one up. Extend 100% + Power to Galaxy S9 or S9+ – The powerful 4700mAh or 5200mAh Li-polymer extended battery case can effectively provide 100%+ extra battery life to Galaxy S9. Keep your Galaxy S9 all day alive. Sync Phone to Computer – File transfer technology supported. Transferring data and file from your Galaxy S9 to a computer without taking the battery case off. Much more convenient. 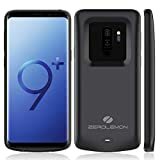 Full Edge Protection – ZeroLemon Slim Power with soft TPU case offers 360° protection to your phone, protecting your Galaxy S9 from scratches and other daily wears and tears. Intelligent Power Indicator – 4 colors indicate you different battery levels and charging status. Integrated button allows you to choose when to charge for when you need it most. Know before you go.